On a cold wintery February afternoon, Rune Nortoft, Race Director at Albatros Travel, was out for a run, when an idea popped into his head. “Running is my creative thinking time and we’d just organised an eclipse-viewing tour to Shanghai and while I was trudging through the snow that day, it suddenly came to me,“ he says with a grin. That was 2009 and the humble beginning of The Solar Eclipse Marathon. 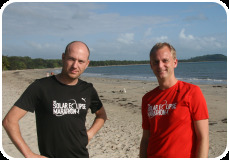 Rune and his colleague Lars Fyhr, International Sales & Event Manager, did some research on eclipses and discovered that the total solar eclipse in Australia in November 2012 would be perfect for a marathon. They got in touch with Travelling Fit, Albatros Travel’s partner in Australia and started planning right away. Port Douglas was chosen as the location for the race and in November 2009, seven months after the initial idea, Rune and Lars were on a plane to Queensland. The first sketches of the course were drawn during that trip. Since then, planning has been going on at full speed and the team went back down under in November 2011 for another inspection of the route and the finishing touches. The Solar Eclipse Marathon is arranged by Albatros Travel, a Danish travel company with Travelling Fit, an Australian marathon travel specialist agency and Port Douglas Event Management. An Albatros Travel Adventure Marathon is a physically demanding marathon that will take runners to a new level. A typical Adventure Marathon course will follow the classic marathon distance of 42.195 km but certain elements must be in place before a run can be termed an Adventure Marathon. Rough terrain, uneven surfaces, abrupt ascents and other small obstructions are all part of the course. The average time for completing the race often exceeds 4.5 hours and finishing times of less than 3 hours and 15 minutes are rare. Apart from this one-time Solar Eclipse Marathon, we also organise four annual Adventure Marathons: the Great Wall Marathon in China, the Big Five Marathon on the African Savannah, the Polar Circle Marathon on the Greenland ice cap and the Petra Marathon in the ancient city of Petra in Jordan. Travelling Fit is an Australian travel agent specialising in packages to marathons, half marathons and multi-stage events around the world. The company offers race entries, accommodation, flight packages, tours and other travel services from Australia. Read more about Travelling Fit. From a small office in Copenhagen, Albatros Travel has grown and now has branches on three continents and employs more than 200 people. Initially focused on Africa, Albatros is a market leader in Scandinavia and offers tours and cruises throughout the world, as well as possessing its own Adventure Marathon brand, arranging long distance runs in exotic locations, such as the Greenland ice cap and the Great Wall of China. The company also has its own award-winning safari eco lodge in Kenya and a refitted luxury cruise ship sailing voyagers to the more isolated corners of the Arctic. A family company, Albatros Travel remains privately owned and has been awarded the AA credit rating for the financial security of its operations.